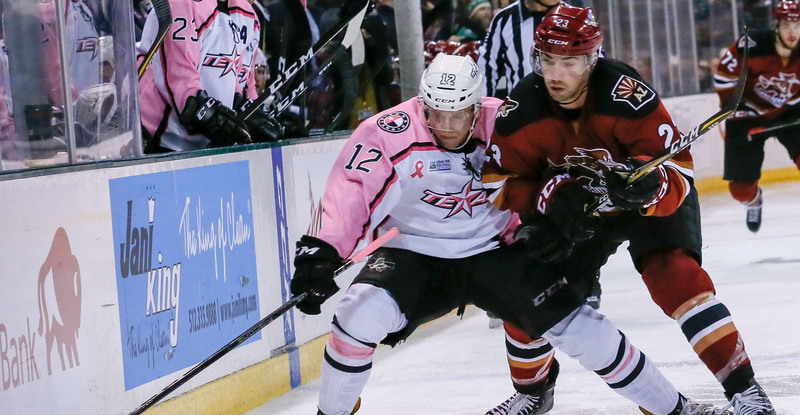 The Roadrunners secured a weekend sweep of the Texas Stars Saturday night, winning 2-1 in overtime at the H-E-B Center. Playing past regulation has become a common theme for the team of late; they’ve extended to overtime or a shootout in five of their last nine contests, winning each and every time. As they did Friday, the Stars were the first to score in the teams’ rematch – Justin Dowling giving Texas a 1-0 lead with just under three minutes to play in the opening frame. Dowling’s marker would ultimately prove to be the only goal Adin Hill would surrender, who in starting his second game since the All-Star break, made 27 saves to earn his 11th win of the season. 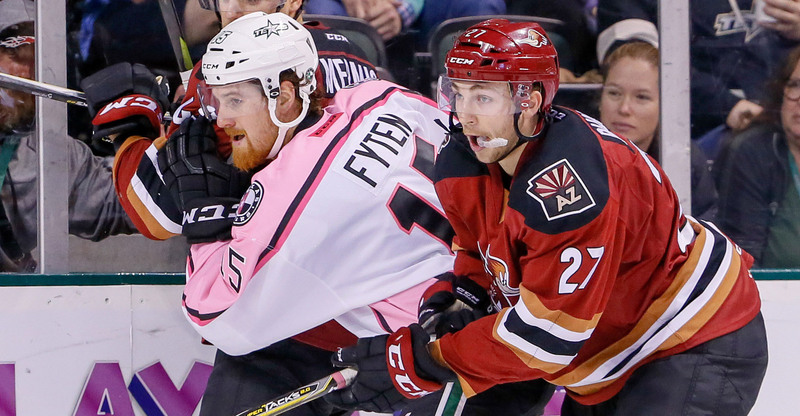 The Roadrunners entered the evening with a 2-11-1-0 record when trailing after two periods of play; they began the third period facing a one goal deficit. With 11:24 remaining in regulation, Dylan Strome redirected a Joel Hanley shot up and over Texas’ Mike McKenna to tie the game 1-1. Strome's tally, his 18th of the season, snapped his personal nine game goalless drought. Tied at the end of regulation, the Roadrunners extended past regulation for the 11th time this season. Working on a power play in the opening minute of the extra frame, Kyle Capobianco fed Mike Sislo, who, stationed in the left circle, fired a one-time shot high past the glove of McKenna to secure a 2-1 victory. Sislo’s goal, his 14th of the year, gives him 30 points on the season. The Roadrunners are now 7-2 in overtime this season, and have won eight of their 11 games played past regulation. The team improves to 16-4-1-1 on the road, and 27-14-2-1 overall, situating them at first place in the Pacific Division. The Roadrunners, now 4-1-0-0 on their current season-long six-game road trip, will complete the trek Wednesday night when they take on the San Jose Barracuda at the SAP Center, where the puck is scheduled to drop just after 8:00 PM MST.